Though legal restrictions kept them grounded last year, Amazon has just been given clearance to start testing its delivery drones in the US. The FAA (the same body that said Amazon's drones were illegal in 2014) has officially given its blessing, but on condition that the micro-aircraft are flown at 400 feet or below, only during daylight hours, and are always in sight of the pilot. Those caveats show that Amazon has a lot of work to do before its Prime Air delivery service becomes the service it wants it to be. But this latest development is a big step forward. 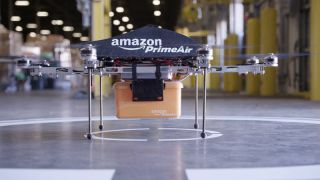 Furthermore, it's expected that the FAA will soon announce revised rules for operating unmanned aircraft for commercial means, which could potentially give Amazon carte blanche to take its delivery service into the big time. But you can fly your own drone right now. Here are the best ones on the market.